Product prices and availability are accurate as of 2019-04-15 09:09:48 UTC and are subject to change. Any price and availability information displayed on http://www.amazon.com/ at the time of purchase will apply to the purchase of this product. The Barbie Star Light Galaxy Barbie Doll And Flying Cat is based on the space fantasy movie of the same title. 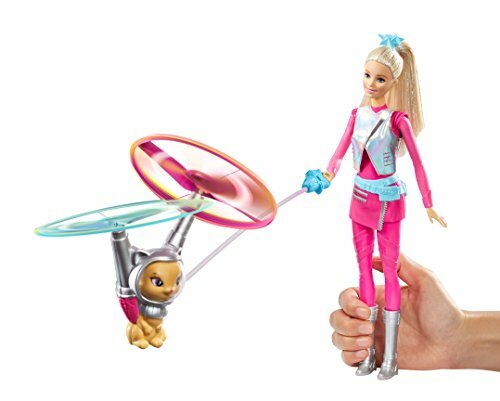 This Barbie has a flying pet cat known as Hover Cat who is also responsible for telling the story of their out of this world adventures. In the show, the two travel to different galaxies and meet lots of colorful and interesting characters in the process. Sometimes in their adventures they get to face dangerous situations. The two are also heroes having saved the universe in several occasions already. With this Playset from Mattel, you can now recreate the adventures of Barbie and Hover Cat. 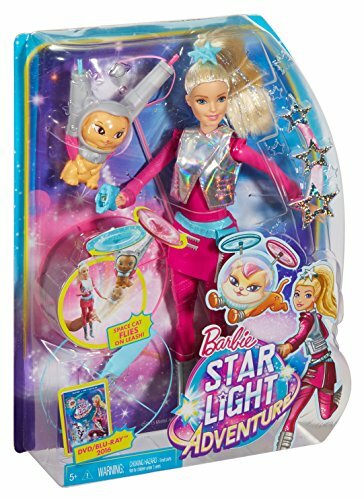 The retail price of this Barbie Star Light Adventure toy is 24.99. It may be a bit more expensive than regular Barbie dolls but that is because of the toy's special features. Considering the faithful recreation of the Barbie character in the movie it is easy to conclude that this toy is priced just right. Who Would Buy This Barbie Star Light Adventure Toy? Obviously, manufacturers of the Barbie Star Light Adventure are targeting fans of the Barbie movie. But even Barbie fans who are not familiar with the movie would surely love this doll. If you are a fan of tone classic Barbie doll though - the one that comes with the beautiful dresses and the cute accessories - them maybe you should skip this one. This is for the Barbie fans and collectors with a sense of adventures, who don't have a problem with the popular blonde icon getting her hands dirty and getting herself in precarious situations. One of the coolest things about this set is that the cat really flies. The action is controlled by a button that is located on Barbie's leg. All you need to do is attach the leash of the cat into Barbie's hands and then push the button and watch in amazement as the cat flies around. There are propellers on the cat that get activated when the button is pressed. This is a wonderful feature because it can open up the imaginations of kids for adventure and storytelling. Barbie, the star of the show, is not too shabby herself. This version has the world-famous doll wearing a futuristic-looking yet still fabulous pink jumpsuit. A shiny holographic vest, plastic skirt, blue utility belt, blue star hairclip and silver boots complete Barbie's look. If you think the cat needs some rest from all that flying, you can take her out from her spacesuit. There are very few negative things that you can say about this Barbie Star Light Adventure toy. As mentioned earlier, if you are looking for a classic Barbie then this one is not for you. Also, the doll cannot stand on its own. This can be a small problem for people who like to display their collection. Even if it is slightly more expensive than regular Barbie dolls, this one is still worth the money because of its many cool features. Plus of course you get a flying cat. This Barbie doll is ideal for Barbie fans and collectors of all ages.